I hope you enjoy these reposted recipes ... I'll be back with all new ones next week! I had a hard time deciding what to call this. 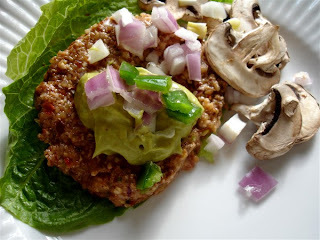 Trying to fit cooked food descriptions on raw vegan foods can be fun, but trying as well. 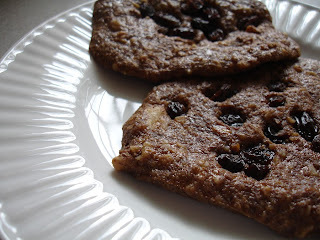 I started out with an idea for raw banana nut bread that could be a breakfast meal with some fruit added. I was in a rush and took them out of the dehydrator when they were still quite soft, which was about two hours on each side. With bananas on top and some agave, they made perfectly soft, almost fluffy pancakes. The ones I left in a bit longer, about twice as long, were excellent for banana nut bread. And, I those I left in even longer, twice as long again, were crunchy banana cookies ... crunchy on the outside, but still having a bit of softness in the middle. Call this whatever you like, and adjust your dehydrating time to suit your preference. For this recipe, the ingredients need to be processed separately and then folded together. 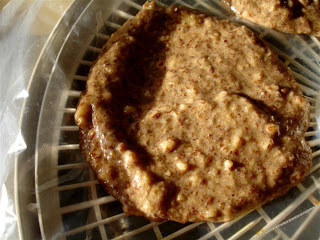 First, add one cup water to the flax meal and set aside to gel. I used the food processor with the S blade to grind one cup of walnuts fairly fine and put them in a large mixing bowl. 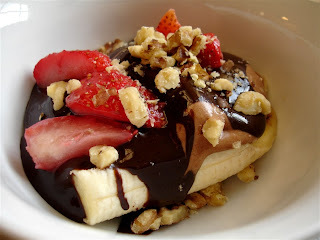 Puree three bananas and chop the remaining half cup walnuts coarsely, add to mixing bowl. Add the salt, spices, and soaked flax meal and stir. Fold in the raisins. Place on plastic, teflex or parchment sheets in the dehydrator. Use a spoon to scoop out 14 portions and smooth out into 3" rounds. They should be about 1/4 in thick and somewhat thicker than when making flax crackers, basically the shape and size of small pancakes. For soft pancakes, flip as soon as it's possible to handle them and then allow to dehydrate on the other side until firm on the outside, but the desired softness inside. 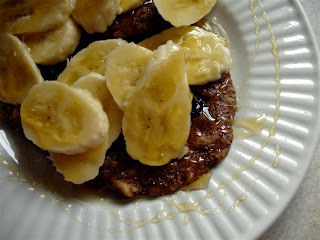 Top with a sliced banana and a tablespoon of agave, coconut nectar, or maple syrup. 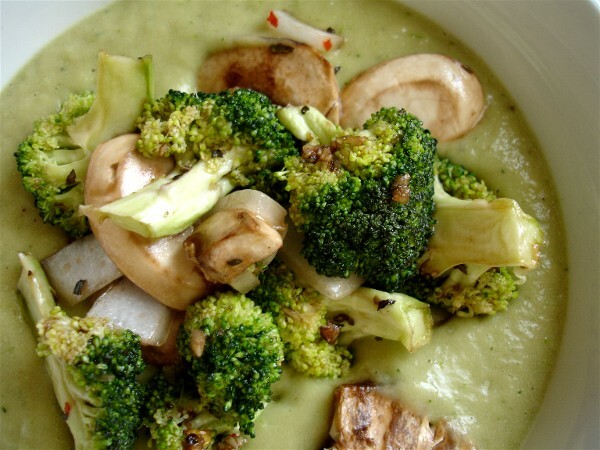 To make this creamy and hearty, the veggies are marinated and dehydrated just a bit before making the soup. 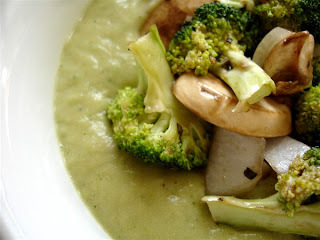 Chop the broccoli and onions and add it, along with the sliced mushrooms, to a container. Whisk together the olive oil, agave, balsamic vinegar, garlic, salt, and a touch of basil. Pour over the vegetables and shake or toss to coat. Let marinate for about a half hour. Then pour into solid dehydrator sheets and dehydrate for about another hour. To make the soup, set aside about a quarter of the marinated vegetables. Take the rest and put in the blender with the avocado and water. Puree until very smooth. Salt and pepper to taste if need, and top with the reserved marinated vegetables and a bit of red pepper flakes. This is more preparation than I usually do, but it still took less than a half hour of actual work. Mostly, it's planning ahead. 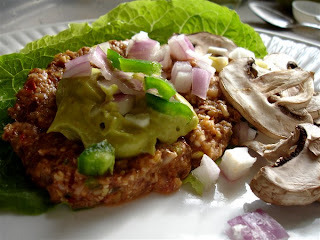 To make the burgers, wash the mushrooms well. Then, to enhance the flavor slightly and remove any excess water from washing, dehydrate the mushrooms for an hour or two. In a blender, puree the red pepper until liquefied, adding water as needed for blending. Stir together with the ground flax seeds and let the flax seeds soak in this for 15 minutes or so, until the flax seeds have become gooey. This is what will hold the burgers together. Reserve about 1/4 of the dehydrated mushrooms and set aside. 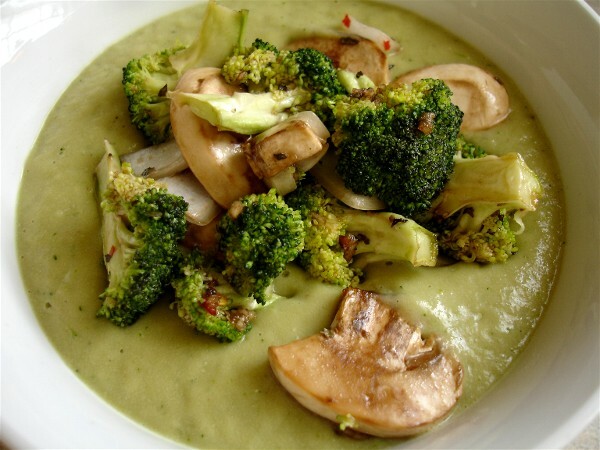 In a food processor fitted with an "S" blade, pulse the mushrooms, walnuts, jalapeno, onion, and celery until chopped finely. Stir in the red pepper and flax mixture and two tablespoons olive oil. Form burgers and place on a teflex or plastic sheet. I spread a bit of olive oil on my sheets so the burgers will flip easily. Dehydrate for about 2 hours then flip onto a regular dehydrator screen and let finish dehydrating, which takes about another 2 hours. The avocado mayo is simple. Just blend the avocado, agave, vinegar and spices until creamy. I used the blender and think this probably needs it to be creamy enough, although mashing with a fork would probably suffice. 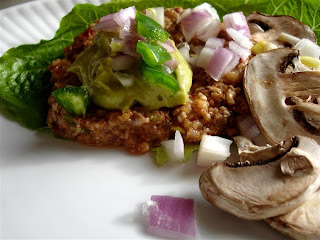 Serve the burgers on a bed of lettuce leaves, with a dollop of avocado mayo, some chopped red onion, chopped jalapenos, and the slightly dehydrated mushrooms that were set aside earlier. I was getting impatient, and hungry, and took my photos below before these were fully dehydrated. They will get a bit darker than is shown here. With the oil in the mix as well as on the sheets, they are as much like a burger as just about anything I've seen. This chocolate sauce is like the really thick fudge found in jars. 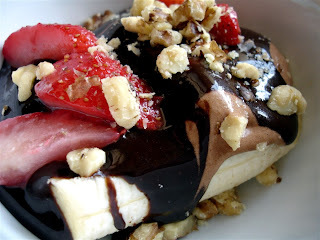 Very yummy with banana ice cream over sliced bananas. Mix up the sauce first. It only takes a minute. Stir together the agave, olive oil, cocoa/cacao powder, and salt. Stir well until creamy and gooey and set aside. I suppose a bigger batch would last quite a while in the refrigerator, since there's really nothing in it to go bad. But I can't imagine it lasting even a day around here. Put the frozen banana chunks in a food processor with a pinch of salt and the 3 tbsp cocoa or cacao powder (omit the cocoa and add a couple tsp of vanilla instead, if desired). Add just enough water to help process. It takes a bit of scraping down the sides, but this will churn up into smooth, creamy, soft serve ice cream. Slice the bananas into bowls, using a half banana for each serving. Put on a few scoops of the chocolate ice cream. 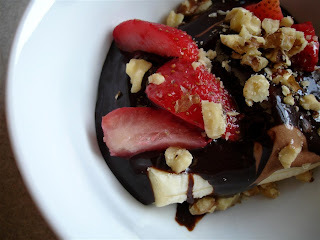 Top with the chocolate fudge sauce, strawberries, and walnuts. Dave the Raw Food Trucker is a raw foodist who lost almost 200 lbs and corrected several health problems on a live, vegan diet. He had a small stroke recently, but is recovering nicely ... and I wish him the very best. Check out some of his videos here on Youtube, he's genuinely inspiring. Until Sept. 12th, I'll be donating 50% of all Raw on $10 a Day (or Less!) ebook sales to Dave's recovery fund. Wow I won!!! What a wonderful gift to win. Thanks so much I sent you an email with my info. The banana bread looks fabulous! I need to make the pancakes and those burgers. Great ideas. And thank you, always and once again, for this AMAZING meal! You spoil, spoil, spoil us...SO well. Wee! Awesome recipes and beautiful pictures to go along with them. I'm especially fond of the mushroom burger. Looks delicious. I love these recipes. I do raw food education and one of the biggest objections I hear is that "it is expensive to eat healthy". I think you've clearly demonstrated that you can eat good, eat healthy, and eat inexpensively. Thanks for sharing!!! LADY how can you paint and hold the cam in the other hand! You make me want to watercolor now. Like I dont have enough to do. I CANT WAIT TO VISIT YOU!